What Is the Purpose of a Lock Washer? Washers are available in all sorts of shapes and sizes. Each washer type has it own unique purpose. For lock washers, they are designed to keep nuts and bolts from coming loose. Lock washers have their own various models. Each is designed for use in a particular application. Some lock washers look like rings with uneven ends. Others appear star shaped with an outer ring of teeth. The lock washer prevents nuts and bolts from turning, slipping and coming loose because of vibration and torque. Different lock washers perform this function in slightly different ways, but the basic concept is to hold the nut and bolt in place. Some lock washers achieve this function by biting into the base material (bolt) and the nut with their ends. A helical lock washer (also called a "split washer") looks like a ring with uneven ends. The ends of the ring bite into fastener material to keep it from turning. 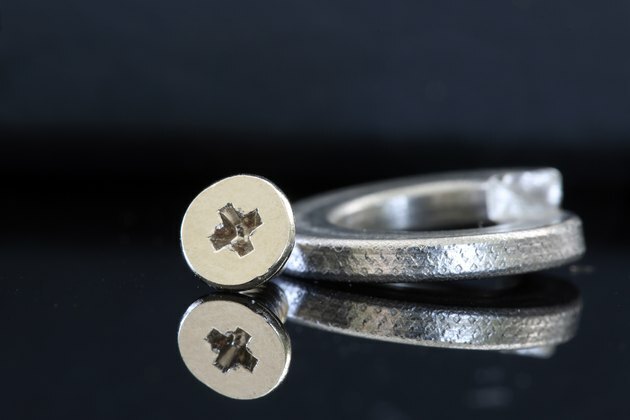 Internal-tooth lock washers have teeth located on the inside of the ring and provide a good connection with small fastener heads. External-tooth lock washer (also called a "star washer") have the teeth located on the outside of the washer ring, which works well with large fastener heads. External-Internal/Combination lock washers have teeth on both the inside and outside of the ring. This provides better security with large fastener heads. Pyramidal-type lock washers are used for projects requiring high-tightening torques. Countersunk lock washers are used with flat or oval head screws having either 82 or 100-degree countersunk angles. Dome-type lock washers distribute load over a wide area and are recommended for use with thin or soft materials that require high torque for holding. Dish lock washers are similar to domed lock washers but can be used in applications requiring less torque or load. Most lock washers are comprised of aluminum, stainless steel, K-Monel, bronze, zinc, phosphor bronze alloy and carbon steel. The material used in manufacturing the lock washer is important in preventing it from breaking down, thereby losing its fastening strength. Lock washers are commonly used in applications involving vibration and possible slippage of fasteners. Industries that commonly use lock washers are transportation related (automotive, aircraft, marine). Lock washers may also be used in household appliances such as air handlers and clothes washers (washing machines). If too much torque is applied to a helical lock washer, it can flatten out and become a regular washer, thereby loosing its locking ability. Additionally, lock washers should not be used as a way to secure a bolt or nut too small for a hole in the part being secured. They should also not be used to to tighten a bolt or nut that's too long. How Does a Shakeproof Washer Work?